This post is designed to show the steps I go through to find a deal through Keepa and how I take it to the next level by thinking outside of the box. Step 1: I head to Keepa to search through their daily and weekly price drops. When I get to the site, I want to look at the percentage price drop (not the actual dollar amount at first). Once I find a product that catches my eye, I go ahead and click on it to take a further look. 1. Large percentage drops on higher priced items. 2. Multi pack price drops. 3. Product in the categories I sell in. 4. Anything that looks fun to own. 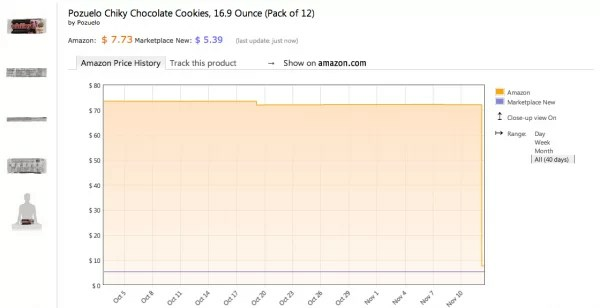 As an example, I saw this product on Keepa a few minutes ago and it caught my eye due to the percentage price drop and multi-pack side of things. Those things peaked my curiosity and I decided to take a deeper look. Step 2: Next I take a look at the chart that Keepa provides once I click on the item. 1. A constant price history with a sudden drop. 2. Signs that Amazon runs out of the product frequently. 3. Any signs that point to Amazon experimenting with pricing (stairstep, skyscrapers, extended periods at a lower price). If #1 or #2 is true, I head to step 3. If #3 is true, I head back to step #1. This product had a very stable price and then there was a sudden price cut. It was an immediate sign to look even farther. 1. 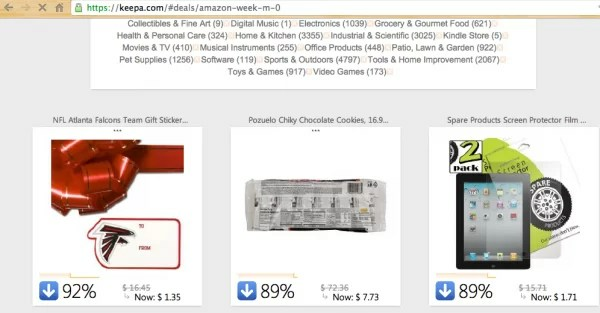 A suppressed Buy Box – A price on the right-hand side that is lower than the one in the middle (typically in stock by Amazon). This means you can order the product, but you won’t get charged until it ships. 2. The sales rank – I am looking for the product to be under 150,000 (my business model). We will take a look at it in more detail, but we need to take a quick look to make sure it is a product that is selling. 3. Other sellers – I want to see how many other sellers are on the listing. The lower the number, the better (you can still make money with a lot of sellers, but you face competition). 4. A complete product listing – The product needs to have a photo and be in the right category. I don’t want to sell a product where the listing is all messed up. For this product, I see that the sales rank falls within my range and the listing look pretty good. I now move onto to step #4. Step 4: Now I am going to head to CamelCamelCamel to take a look at the sales rank history. This is going to give me a good idea of the demand side of the equation (price drops are great, but you need someone to buy the product at a higher price to make money). 1. Sharp drops in sales rank when a product goes back to the original price. 2. A fast spike to a high sales rank when the product is on sale. 3. Long downward trending sales ranks. 4. Good performing sales ranks with multiple hills and valleys within my sales rank range. If 1-3 are true, I tend to shy away from the product. The item’s sales rank is artificially low due to the drop in price and will not sustain once it gets back to the higher price. If 4 is true, the item is headed for my shopping cart (after I look at the ROI through my FBA calculator extension). The example product nails number #4 as it bounces, but never goes below my acceptable range for sales rank. Step 5: This is the step that will make a difference in the long run. People can find the same deals that you do, but very few go the extra step. This is the next step I took after seeing the product. Since it was a multi-pack, I wanted to see what other selling options (packs and single) are out there. I did a quick search and found the following (that fell within my sales rank range). Now not every product will be a hit, but you at least have a framework to work from when sourcing items online. You also might want to check out Stephen Smotherman’s video below which is a great Keepa tutorial for one of Amazon’s top sellers. Once you’ve sourced great products to sell, you’ll also want to keep them competitively priced. RepricerExpress offers instant repricing on all plans (no added costs). Check out our free 15-day trial today and get started with Amazon’s fastest repricer. Chris Wilkey is one of the masterminds behind FBA Master. He started selling on Amazon in 2013 and has been selling ever since. He is a digital marketer by trade and has brought his talents to life on fbamaster.com. Chris has a knack for teaching and loves to help those who are just getting started. He lives in Indiana with his wonderful wife and his two cats.